Did you take the poll last week? 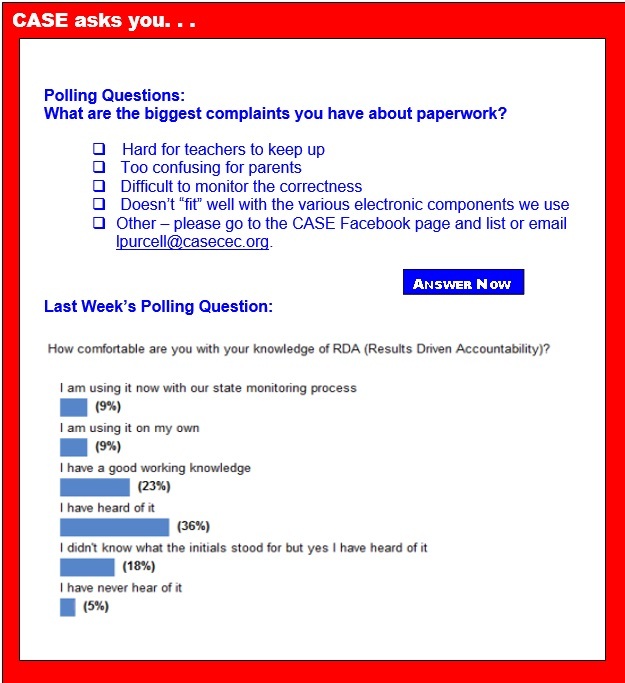 Last week the question was about RDA, Results Driven Accountability. Of those taking the poll, only 20 percent are using it with the state department or on their own. About a fourth of those taking the poll had a good working knowledge of RDA. A third of the participants were familiar with the term but almost 20 percent did not recognized that RDA was results driven accountability but once they saw that, did recognize the terminology! And finally, 5 percent of those answering the Poll said they had never heard of the term. It is really hard to stay caught up with all the trends, terms, legislation, changes, litigation, and issues. Even the "good stuff" is hard to keep up with between all the budget issues and other "fires" you put out on a daily basis! That is why you need CEC and CASE! We keep you in the loop so you don't have to be surprised or stressed out any more than you already are! Keeping you in the loop is why it is so important for CASE to maintain active partnerships with other associations, with OSEP, and our legislative branch! But, even if we do our best to "keep you in the loop," you have to read the emails, come to our professional development opportunities, and be active at the state/provincial level! We have an amazing opportunity at our upcoming CASE Board of Directors' meeting (Nov. 12-13) and the 25th Annual CASE conference (Nov. 13-15) in San Antonio: the Government Accounting Office will be soliciting input from our members on paperwork and administrative regulations from IDEA. We have all "whined" about these for years but now is the time to make a positive impact — but we need your voice! If you have not considered attending the CASE 25th Annual Fall Conference, please do so! Still haven't registered for the 25th Annual CASE Fall Conference? Well, there is still time! The room block is filling up but there are still rooms available. Professional Development Chair, Will Gordillo has put together an amazing program for our CASE members for the 25th Annual CASE fall conference! Our three keynotes will definitely inspire you but they also will provide you with a wealth of practical tools you can use in your everyday work ASAP. Drs. Stevan Kukic, Randy Sprick, and Frances Stetson will totally blow you away with the quality of their presentations! I have heard each of these 3 professionals on many occasions and I have always left with new ideas, new tools and a feeling that the job I do is important and necessary! The 30+ breakout sessions are also full of practical, evidenced based information. Click here for a list of the breakout sessions. If you want to learn what's new, connect with your colleagues from around the U.S. and Canada, and experience some quality professional learning that is both inspirational and content laden, then join us in San Antonio Nov. 13-15! Registration is up at www.casecec.org. The End of Bullying Begins with Me is the message to remember during PACER's National Bullying Prevention Month in October. It's a time when communities unite nationwide to raise awareness of bullying prevention through events, activities, outreach and education. New Leaders and the Bush Institute's Alliance to Reform Educational Leadership launched the Conditions for Effective Leadership Project and partnered with leading researchers and practitioners to generate a comprehensive and research-based framework outlining the conditions necessary for transformational school leaders to succeed. Based on results from the Conditions for Effective Leadership Project, which included more than 20 education and leadership experts brought together by the Bush Institute and New Leaders, Great Principals at Scale: Creating District Conditions That Enable All Principals to Be Effective offers a framework of conditions that can help districts enable great school leadership. Schools should be a first line of defense for catching young people at risk for mental health issues from depression to ADHD, a pair of new reports says. Kids and adolescents spend a significant amount of their time in school, yet providing mental health screenings and care is not an overarching requirement for many schools. "We need to think about how to embed mental health services so they become part of the culture in schools," says study author Dr. Mina Fazel, a child psychiatrist at the University of Oxford. "It will take a commitment from health and education." Co-teaching implemented with fidelity has a profound impact on a range of learners with and without disabilities from a variety of cultures. Co-teaching is often characterized as a "marriage" between a general education and a specialist. Formally defined, co-teaching is two or more educators sharing responsibility for teaching some or all of the students assigned to a classroom. According to Marilyn Friend and Lynne Cook, it involves the distribution of responsibility among people for planning, instruction and evaluation for a classroom of students. Clifford the Big Red Dog looks fabulous on an iPad. He sounds good, too — tap the screen and hear him pant as a blue truck roars into the frame. "Go, truck, go!" cheers the narrator. But does this count as story time? Or is it just screen time for babies? It is a question that parents, pediatricians and researchers are struggling to answer as children's books, just like all the other ones, migrate to digital media. A fight or flight reaction may be useful in some situations, but it is highly detrimental in the classroom. Whether anxiety stems from test taking or from an unstable home environment, the brains of students experiencing high levels of stress look different than those who are not — and those brains behave differently, too. Schools should be a first line of defense for catching young people at risk for mental health issues from depression to ADHD, a pair of new reports says. The Obama administration's proposal for revamping the controversial School Improvement Grant program doesn't give states and districts enough flexibility in coming up with turnaround prescriptions for low-performing schools, advocates say, in their formal responses to the plan. The theme of a number of comments from key organizations is, essentially, that the department didn't give states and districts nearly as much flexibility in the proposed regulations as Congress appeared to be hoping for. It's the most common learning disability, affecting roughly 1 in 10 Americans and 20 percent of school-age children. Yet in many cases, it goes largely undiagnosed. It's dyslexia, a language-based learning disability that results in problems with accurate or fluent word recognition, poor reading and decoding abilities. If left undetected, it can lead to frustration with school or low self-esteem. And while there's no "cure" for the condition, there are treatments that can allow those who have it to function as well others. A brand-new study on the academic effects of homework offers not only some intriguing results but also a lesson on how to read a study — and a reminder of the importance of doing just that: reading studies (carefully) rather than relying on summaries by journalists or even by the researchers themselves. Let's start by reviewing what we know from earlier investigations. First, no research has ever found a benefit to assigning homework (of any kind or in any amount) in elementary school. Salli-Ann Holloway could not breathe. Sitting in her Advanced Placement English class, she could not stop shaking. Her neck twitched relentlessly. She gasped for air. Her body went numb. Holloway, 17, rushed to the school nurse's office as she had many times before. Panic attacks had become commonplace for her as the stress of junior year took hold. The nurse soothed her as they waited for her mother to arrive. This would not be the last time Holloway's illness interrupted her life. The already muddy research on whether it's better to hold back struggling students or promote them to the next grade just got muddier. A new study, "The Scarring Effects of Primary-Grade Retention? A Study of Cumulative Advantage in the Educational Career," by Notre Dame sociologist Megan Andrew, published Sept. 26, in the journal Social Forces is an empirically solid analysis that adds more weight to those who say retention — what education wonks call repeating a grade — is ultimately harmful. More than 95 percent of teachers believe the parents of their students do not understand what the Common Core State Standards are, according to a recent poll of veteran high school teachers in the northeastern U.S. No teachers told the surveyors they believed their students' parents knew what the standards were and 4.4 percent said they weren't sure. With springtime testing for the Common Core only months away, nearly a third of district superintendents are still scrambling to put in place the curriculum and professional development necessary to teach the standards, according to survey results. The Center on Education Policy, which has been tracking Common Core implementation since the standards were released four years ago, concluded in its report that "the future of the Common Core remains uncertain at this important juncture" because many districts still are not fully prepared to impart the new academic expectations in English/language arts and mathematics. Kelli Sandman-Hurley, a contributor for Reading Today Online, writes: "Two years ago my life changed with a cocktail napkin at a dyslexia conference in Baltimore. I spent two days listening to Peter Bowers, the founder of The WordWorks Literacy Centre in Ontario, Canada, and Gina Cooke, the author of the blog LEX: Linguist-Educator Exchange, in the booth next to me, talking to dozens of people about something that just sounded like 'another program for those with dyslexia.' But after two days, I figured all those people talking to Peter and Gina with such newfound enthusiasm must be on to something. I turned to Peter and said, in my most skeptical voice, 'Okay, tell me what all this hullabaloo is about.'"